The greatest basketball player in Philadelphia’s LaSalle High School, where he scored 2,222 points, Gola went on to similar “greatest ever” praise at LaSalle College. He was named All-American in each of his four years in college (1951-55), scoring 2,461 points and gathering 2,201 rebounds to lead LaSalle to a 102-19 record, the NIT title in 1951, the NCAA crown in 1952 and runner-up in the NCAA in 1955 to Bill Russell-led San Francisco. In a 10-year NBA career with the Philadelphia Warriors and New York Knickerbockers, Gola led the Warriors to the world championship his rookie season, scored over 8,000 points and was named All Pro five times. “Mr. All Around,” Tom Gola, began his glorious basketball career as the finest all-around schoolboy star at Philadelphia’s LaSalle High School. His high school coach, Charlie O’Brien, called him “the greatest player since the end of the center jump.” Tom tallied 2,222 points in his prep career. Gola moved on to LaSalle College in his hometown and enjoyed great personal success while also leading his school to great team success as well. Because of its small enrollment, LaSalle was one of many schools permitted to use freshmen during the Korean War. In Gola’s initial season at LaSalle, the Explorers were 25-7 and won the NIT where Tom was co-MVP with teammate Norm Grekin. He was invited to the Olympic Trials and was named All-American. In his sophomore year, LaSalle finished with a 25-3 mark. His junior year, the Explorers were even better, ending the season at 26-4 and winning the NCAA title by defeating Bradley 92-76. Tom was named tournament MVP and also gained College Player of the Year accolades. 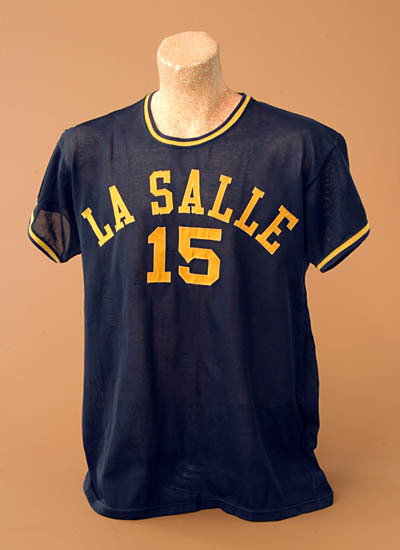 Gola led LaSalle back to the NCAA finals in 1955, his senior year, but were defeated by the Bill Russell-led University of San Francisco. In each of his four seasons, Tom was named to All-American teams, one of only six players in basketball history so honored. LaSalle College had a 102-19 won-lost record during the “Gola years” and finished in the top 20 nationally each year. He scored a school career record 2,461 points and hauled in an NCAA record 2,201 rebounds. Following graduation, Gola was drafted by the NBA where he enjoyed a ten-year career with the Philadelphia Warriors and the New York Knicks. In his rookie season, he helped lead the Warriors to the 1956 NBA Championship. This title made him one of only two players in basketball history to win the NIT, NCAA and NBA championships. For his career, he scored over 7,800 points, had over 5,600 rebounds and averaged 4.2 assists per game. He was named to the All-Pro team five times. In 1968, Gola returned to his alma mater as head basketball coach. During his tenure, he led the Explorers to a 37-13 record over two seasons and a number two ranking during the ’68-’69 season. Following his basketball career, Tom was elected to the Pennsylvania State Legislature and later served as comptroller for the City of Philadelphia. Gola is a member of the Madison Square Garden Hall of Fame and the Helms College Basketball Hall of Fame. In 1960, Sport Magazine selected him for their All-Time All-American Team. In 1976, Gola was elected to the Naismith Basketball Hall of Fame. LaSalle named its athletic complex the Tom Gola Arena in honor of its favorite son.